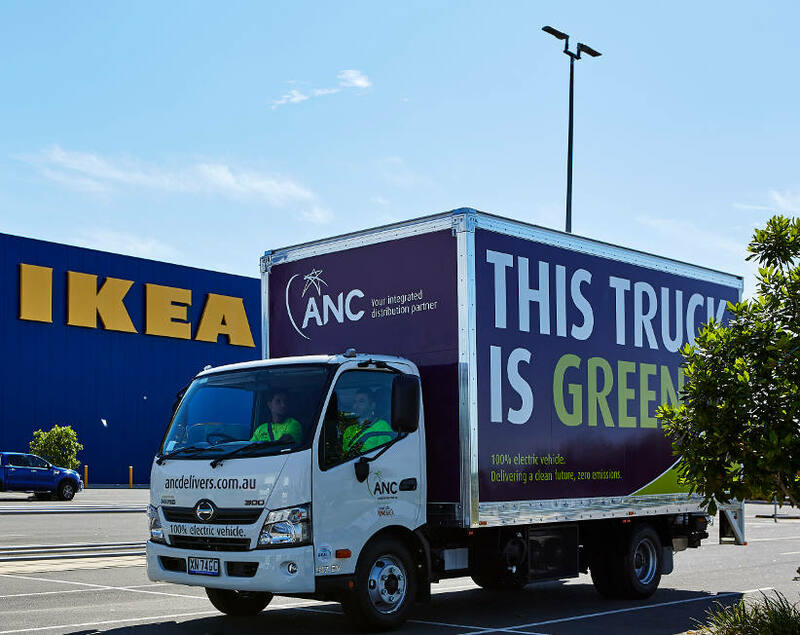 ANC has unveiled its first commercial electric vehicle fleet, dedicated to its client IKEA’s last mile home delivery services in New South Wales. The introduction of three 100% electric vehicles is part of ANC’s strategy to introduce an environmentally sound transportation alternative to its clients and their customers. The zero-emissions commercial trucks will save an estimated 36 tonnes of CO2 per annum when compared to a typical diesel equivalent. ANC’s electric vehicles (EV) comprise a Hino 917 Series truck base built without a motor, gearbox, and exhaust, replaced with SEA Drive 120a electric components by Australian-based SEA Electric and a custom designed cargo box. The modular electric driveline enables the replacement of individual components as technology advances, extending the vehicle’s lifecycle. Components include electric battery packs with a lifespan of over 10 years which are 99.7% recyclable at end-of-life. As a national provider of delivery services for the likes of IKEA, Bunnings Warehouse, Miele, Williams-Sonoma, JB Hi-Fi and The Good Guys, ANC took the opportunity to design the cargo box with retail deliveries and the customer experience in mind. The box stands at a slightly taller 2.5metres, which allows for a larger number of bulky goods to be packed vertically, so it can take an average 17 deliveries per run, compared to the standard 10-12 deliveries per run. The cargo box has built-in padded wall racking to secure and protect the goods in transit. A Kemlite roof allows natural light into the box for greater safety when delivery professionals load and unload the goods. In addition to launching the EV fleet, ANC is expanding its bespoke route optimisation program to reduce average kilometres driven, another positive environmental impact. Since March 2018, route optimisation has increased delivery run efficiency with improved delivery density and demonstrated decrease kilometres driven by up to 30% per delivery run. Lower kilometres per run means decreased fuel consumption (electric or diesel), minimises brake dust particulate pollution and reduces the fleet’s contribution to traffic congestion. Note: Estimates based on manufacturer specifications. Precise data being aggregated from fleet in-market performance.